That’s usually the response I get from people seeing an improv show for the first time. Of course not. How could anyone go from watching an improv show to being in an improv show overnight? Perhaps the more appropriate phrase is, “I can’t do that right now.” With training, this person is eventually able to get on the stage. So what if the stage is taken out of the equation? Can a person who has never practiced improvisational theater actually improvise, and if so, for what benefit? Improv for Business – When business people let go of improv comedy, they discover that it’s actually a tool for communicating and connecting. At the office, whether working with an internal team or with a client, employees must be in the moment, practice active listening and be able to contribute to forward movement whether it’s brainstorming or problem solving. Improv’s “yes, and …” tool enables the corporate set to accept what is happening and build upon it in a collaborative, co-creative way making for a more flexible, adaptable team. Improv for the Classroom – Improv builds trust and gets kids to laugh with each other instead of at each other. In the classroom, building support and trust makes for a more engaged class. More engagement means more learning is happening. This also enables students to be free to make mistakes while also growing their self-confidence. Improv for Relationships – In improv we explore an alternate universe because we accept another person’s reality. By using the “yes, and …” tool we empathize with what the other person is saying based on their perspective of the situation. We focus on being open and engaging, so we don’t deny the other person’s reality. Imagine if we practiced that in our own relationships. Two magic words that can improve work, home & life – off stage! Improv for Seniors – Improv creates a built in community and an opportunity to make connections while also juicing creativity and imagination which enables seniors to thrive. Through improv, seniors are drawn into active social situations that keep isolation and loneliness at bay, which is important to senior mental – and physical – well-being. There’s improv for medicine, for parenting, for college freshmen, for singles, for language learners, for non-profit managers, for humanitarians, for trainers and for just about any other kind of person or situation you can imagine – out in the world. Whatever the situation, improv makes all of us nicer, kinder people and isn’t that what the world needs more of as we continue to face challenges – together? 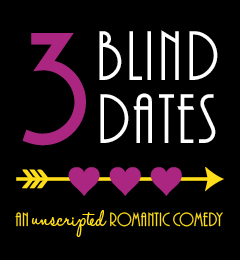 An unscripted romantic comedy, 3 Blind Dates follows 3 single ladies through a round of speed dating and the dates that occur as a result. The twist? The audience selects which speed dater goes on a date with each of the ladies! It’s the perfect romantic comedy for Valentine’s weekend! Please visit The Adventure Project’s calendar for tickets and more event information.